Alastair Thompson asked me if I’d assist them to report the trial, and he wrote a measured letter to Judge Harrop asking for me to be allowed to do so, subject to editorial surety that I would be informed about, and abide by NZ court reporting rules. Judge Harrop agreed to this, and I am now an accredited scoop reporter for the trial. I’m allowed to sit at the media table and take notes. Who’da thunkit? A new career at my time of life. I’ll file from now on with scoop, and after they’ve published I’ll update this blog. The defendents have all finished giving evidence and being cross-examined. I’m exhausted and going off for a big sleep, so start looking for my coverage of today’s proceedings in about 24 hours. Meanwhile the scoop reporter from Wednesday wrote a pretty cool and sympathetic background piece here. I’m ordered by the Court to cease reporting on this trial. This morning I was called into the closed Court by Judge Harrop and shown an extract of my blog from Day 2. The extract contained a photo of Adi Leason that I captured from a TV3 broadcast, and a paragraph that I wrote saying that legal argument had taken place. Judge Harrop never mentioned the photo, but he said that the mention of things which happened in the absence of the jury was against the court reporting rules in New Zealand. He ordered me “to desist from any further reporting of this trial until after it is finished” and he reminded me of his powers to find me in contempt and imprison me for the duration if I disobeyed his order. Upon my request he allowed me to publish his order, and explain the sudden absence of reports on this site about the trial. I WILL OBEY the Judge’s orders, because I agree with him that no-one wants to see this trial aborted. Indeed, I have gone further and removed the offending paragraph. The freedom of speech around court hearings is an important part of democracy, and one I will take up after this trial is over – but it is not the central issue just now. The central issue is the conscience, action and trial of Adi, Peter and Sam. Yesterday was a short day in Court, and concluded with a very successful public meeting at St John’s Presbyterian Church that evening. Adi re-stated the importance in his life of a deep and strong Christian faith. “Everything I know, and everything I’ve read in the Bible can be boiled down into two things” he said. And these two principles lead to a way of life: “Do unto others as you would have them do unto you”. 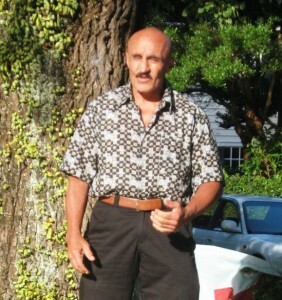 He then went on to tell the story of that period after he’d returned from Thailand and moved to the farm at Otaki. His mother became terminall ill, so she moved into Adi’s house where he (with community nursing assistance) cared for her through the process of dying. His mother died at home surrounded by family. Weeks later a child was born in the same bed. As he tended his garden and watched the seasons roll on in the established pattern he reflected on how important family was to human life. Around this time he saw a TV interview with an Iraqi grandfather who was holding the body of a dead grand-child, and who, according to this BBC report, had just lost every living member of his family in a US bomb attack. “That man just looked so desolate” Adi said. “The bomb that killed his family would have been sent there by ELINT collected at bases like Waihopai that were part of the Echelon network”. “At that time I started to feel a knot in my stomach, and I knew I couldn’t carry on JUST praying. 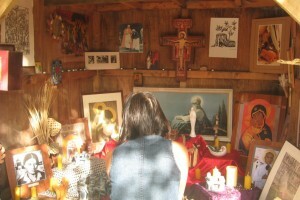 I mean prayer is great, and our family begins every day with it, but it was becoming clear to me that more was needed”. “I couldn’t avoid reflecting on various ploughshares actions around the world”. He cited the ANZAC Ploughshares at Griffis Airforce Base conducted by Ciaron O’Reilly and Moana Cole (friends of his). The Liverpool based Seeds of Peace Ploughshares. The Pitstop Ploughshares at Shannon Airforce Base, The Christians Against ALL Terrorism at Pine Gap in Australia. He described “a growing sense that this was a possible opportunity for me to act on my belief”! 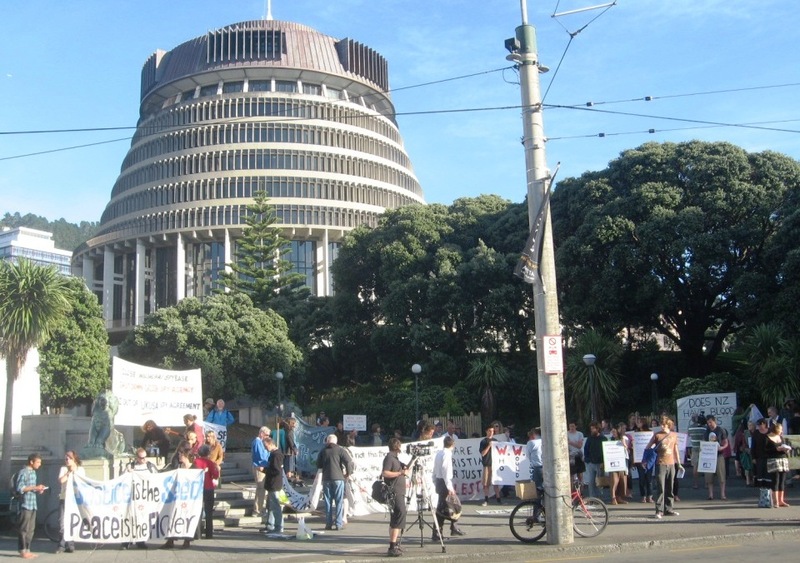 Then he described some of the history of legitimate protest against waihopai over 20 years, all of which failed to achieve anything more than “a total stonewall non-response”. 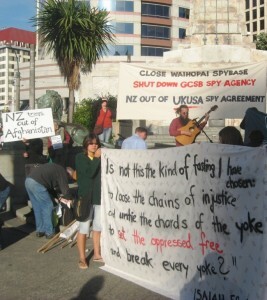 “In January 2008 Sam (Land), Peter (Murnane) and I started seriously discussing an action to disable Waihopai Base”. Mr Knowles then took Adi through the action itself. “40,000 Volts (the electrified security fence) is a significant deterrant”. Despite the humour Adi showed himself to be dead serious about his act of disarmament. At several points the crew had to overcome fear (of discovery, of injury and death) in order to proceed with their plan. In a compelling moment explained that the thought he kept in his head during the danger and hardship was of his 3yo daughter. He imagined another 3yo in iraq under threat, and asked himself “would I do this to save my daughter? Yes I would”. And so he acted to save the imaginary child across the seas. So they got into the base undetected. They cut through and deflated the dome undetected. They built a shrine, hung banners, and began prayer – all undetected. 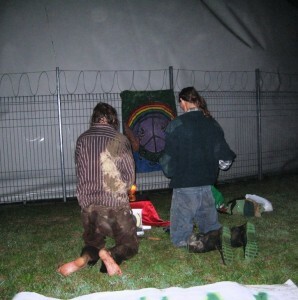 Just before they sliced through the dome they prayed together “We disarm you in the name of Jesus Christ”. Eventually security came. The crew made sure that security personnel felt safe and, after inviting them to join in prayer, they surrendered all the sharp tools, along with the key to the now padlocked and chained front gate. They waited calmly for Police and for the trial they are now undergoing. I watched the jury members a fair bit during Adi’s testimony, and there’s no doubt he has their full attention. I can’t tell what’s going on in the mind of a jury member, but I found it difficult at times not to cry during Adi’s testimony. He is such a loving and thoughtful man, acting at great personal risk, but without rancour or self-righteousness. Fortunately I get a chance to hug him each day while he’s still free, and I feel refreshed and inspired by his shining example. The Emporer has new clothes! Which is more than I can say for Mr Murray, the prosecutor, who I feel alternately sorry for, and a bit pissed off with. The Prosecutor’s job is to tear down Adi’s tender concerns. To ridicule and undermine him. He started that at about mid- day yesterday and carried on for 45 minutes. “You didn’t spend much time taking inoffensive protest action about the base did you?” (others did for 20 years, none of which worked). Sometimes i think Mr Murray is an agent paid by the Emporer to pretend the new clothes are both warm and beautiful. I ask myself how he can stand the falsity and emptiness of performing his task. Then I remember that the evil roots of the war system keep otherwise good folk away from truth. away from a personal experience of power and goodness. trapped in a shallow mire of consumerism. I try then to forgive and love Mr Murray. During the lunch adjournment a juror became ill, and Court was adjourned for the day. 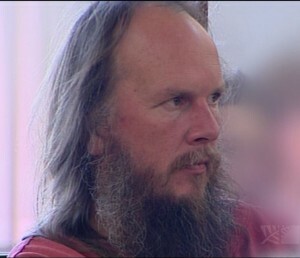 Adi’s cross examination will continue today, and then we’ll hear testimony from Father Peter Murnane. I apologise for the absence of photos today, but yesterday was very full, and I have a little physical tiredness now. Last night was a great public meeting where two traditional political activists (Murray Horton from the Anti-Bases Campaign, and Greens MP Keith Locke) spelled out clearly what the base is, and how limited is the process of Parliamentary accountability. Then Moana Cole spoke powerfully and eloquently of the Ploughshares prophecy, philosophy, movement and hope. I made a little slide presentation about Pine Gap, nonviolence, and the joy of powerful NVDA. There were 120 or so at the meeting with a great feeling, and a spirit of determination. That’s it for now. I’m off to court again soon, and I’ll report back on this blog. Your support and interest means a lot to the defendents. keep the messages of support flowing. 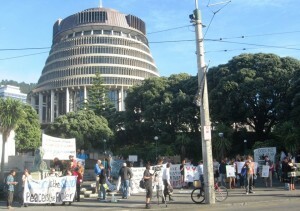 Around 100 people from Wellington gathered at the Cenotaph next to Parliament house, with banners and signs and an abundance of goodwill. At 9 am we all processed to the District Court building and sang in support of the 3 defendants. Adi called on the children and mothers – our future – to come forward for a particular blessing. Some stayed outside all day maintaining a vigil and public witness, others filled the public gallery to overflowing. The morning was spent empanelling the jury, instructing the media (one pool television camera has been allowed inside the Court) and there were around 8 media workers witnessing all morning and some of the afternoon. Judge Harrup instructed the jury on how the trial process would run, and what their duties were. My first highlight was hearing a judge talk with a Kiwi accent. My second thrill was hearing the Judge refer to Peter Murnane as “Father”. Then we had the opening addresses, with Mr Boyd-Wilson opening for the prosecution. He was young, and his presentation of the facts was dry and basic. He did a good job for what seems in some ways to be an open and shut case. At the beginning it was “Peter Murnane, the accused”, but Mr Boyd-Wilson couldn’t help himself, and the “Father Murnane”s emerged from his mouth and continued throughout the day. I think it’s hard to seriously condemn someone you’re calling “Father”. 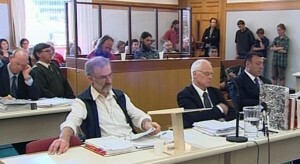 Because the facts are not being disputed, the real work of the prosecution will lie in knocking down the defences that the Waihopai 3 plan to raise – “necessity”, “self defence” and “claim of right”. “This is an exceptional trial. There are times when law, morality and humanity come together to make would otherwise be unlawful. Those times are when the preservation of human life is involved. Human life is no less a human life because it resides in a foreign land, or dresses funny, or has a different skin colour. Then Peter Murnane, who’s representing himself showed both his character and his motivation to the jury and said what he will say many times during this trial – that he broke a lesser law to protect the lives and property of others from serious threat by the US military. – the widespread use of WMDs, particularly depleted Uranium. 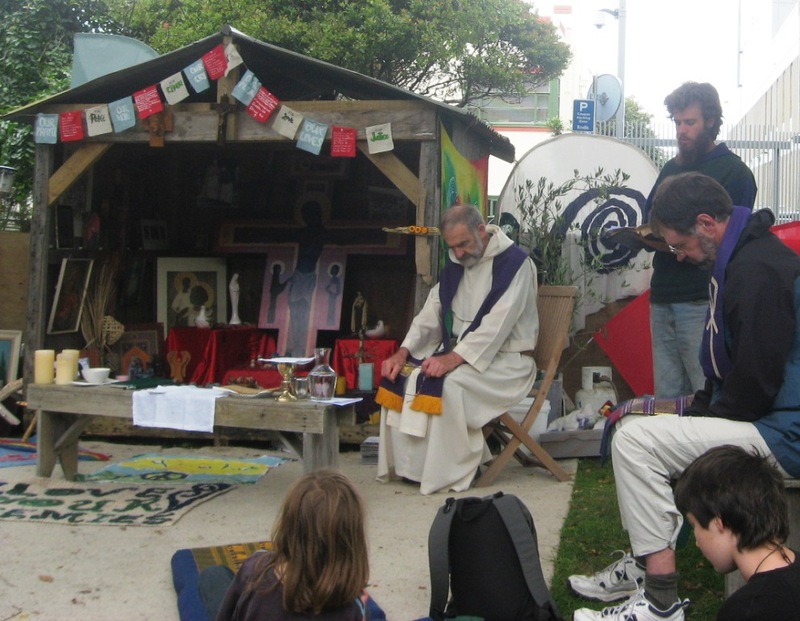 It was in opposition to these crimes that the Waihopai Ploughshares deployed nonviolence in the tradition of the Catholic Workers and Ploughshares actions, makingmanifest the prophecy of Isaiah. Mr Shaw, for Sam Land brought out the great covenants of international law, and said the defendants were acting nonviolently against such consequences of Waihopai asGenocide, torture, arbitrary detention and the targetting in war of civilian populations. supporters picketed outside GCSB HQ in Moreland St.
After lunch, the prosecution led all of its eight witnesses, six of whom are Police, along with one GCSB security guard and a local farmer. 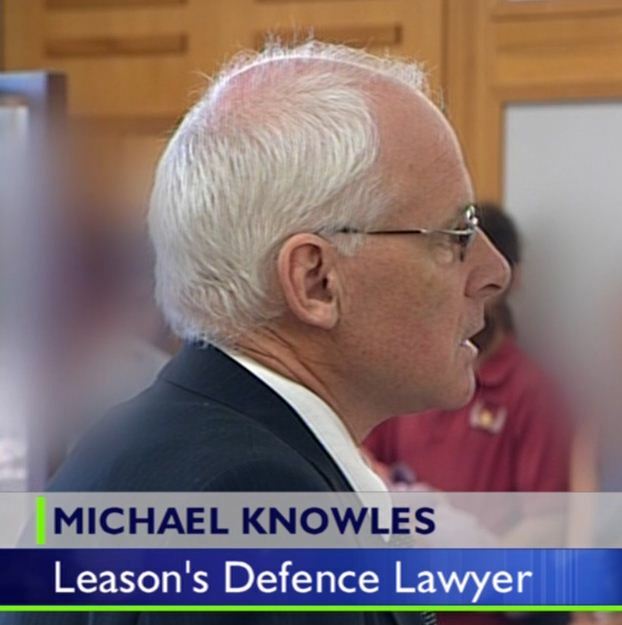 Because the facts are agreed, I was mainly interested in what the prosecution testimony revealed about the security state, and about the security at Waihopai. First, the sophisticated and unbeatable security alarms stop working under some “atmospheric condition” (rain). So does the electrified fencing. Second there was fog, either “some passing” or “thickly wrapping” the base. I’m interested in this because none of the accused saw any fog at all, and think it an excuse made up to cover a poor security performance. I wonder whether the fog might not have beencreated by God in the minds of state security as he walked with his children into the base (just speculatin’). Third was the respect and acknowledgement of humanity between all the security/police and the three. It was clear that all these people share mutual respect. Fourth and final was the showing of video-taped interviews conducted between Detective Kevin Nicholls and Father Peter Murnane – in which Peter’s humanity, knowledge, commitment and ascerbic wit shine through. What Peter said to Police on the day is exactly the same as he is saying to the Jury today – and the jury must have been impressed with his integrity and genuine feeling for life and Christian principles. Which rounded out the day in Court. Support crew and defendants kept on with organising and networking tasks (and prayer). In the new morning tomorrow the defence will begin calling evidence. The trial is expected to last another seven days. 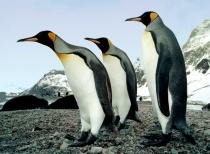 Author bryanPosted on March 8, 2010 2 Comments on Day One Goes Off! Well, the trial process has started, but its venue – Court 3 of the District Court at Ballance St in Wellington – is presntly closed to the public while the Jury is being selected and empannelled. I’ve counted 3 television networks and 12 media workers altogether waiting at the Courtroom doors, along with 40 supporters and family waiting for admittance. Over the road another 60 or so are gathered singing and vigilling. Peter, Adi and Sam are all in good spirits, and were bouyed by the procession of more than 100 from the Cenotaph to the Court. Peter, as an ordained Dominican priest is the leading public figure, and as I understand it will be representing himself during trial. Adi and sam each have legal representation, and the principle task in front of them is to get the waihopai three an opportunity to call a range of expert witnesses on hand. As I understand it, the defendents want to run a necessity defence, while the lawyers also want to test the prosecution case. All would like to win acquittals, but the three are personnaly prepared for conviction, and willing to do time in prison if it comes to that. It’s a fine, even glorious day in Wellington. The spirit is with us. Prayer on the path to peace. 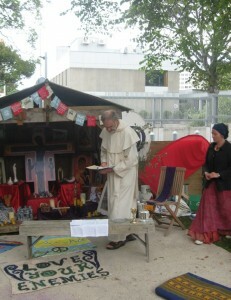 As the Waihopai Ploughshares head to trial tomorrow one of the defendents, Fr Peter Murnane, officiated at Mass this morning at the shrine outside the US Embassy. About 40 came to worship and make communion with the body of Christ. In his homily, Peter reflected on the nature of peace, and how it rests on the principles of repentance for wrongdoing, forgiveness of sin, and love for God and each other. He drew attention to the Embassy and how the people living and working in it were in a state of constant fear- as shown by the weapons, defences and architecture of a building in the otherwise sweet sunshine and clear air of a beautiful Wellington day. He contrasted that with the trees, grass, and living nature of the park in which God’s presence burned everywhere with green fire, and where we gathered to give thanks and praise. He reminded us that God was also present in the hearts of those who worked for empire, and that our work as peace-makers was one of transformation rather than condemnation. So that while we might work to stop the military machine, and stop the bad behaviour of empire, the key aspect of our work was transformational as we called on God to restore the joy and clean hearts of all the Embassy personel, of ourselves, and of each other. Then we made communion and prayed. There’s a new peace group in Cairns. A bunch of us has met twice now, and we’ve talked about how to stop US warships from visiting Cairns. Margaret, Steve, Rob, Mike, Paul, and I have made decisions about the what, how and who of taking effective action. Trish, Sarah, Polly, Carla, Jonathon and Stu will join in the training, and the support/action. 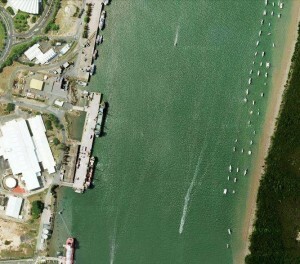 We are going to make the US Navy’s job a lot harder every time they come to Cairns. We’re meeting again on 3 March to move the costumes forward (penguin/stinger suits), and decide on a training program and public launch. We have three swimmers, a media guru, a techno-geek, a community artist, and a bunch of otherwise ordinary folk willing to witness, support and organise. We’ll take dramatic and effective NVDA every time a US warship arrives. We’ll use that NVDA to spread the word and build the movement. 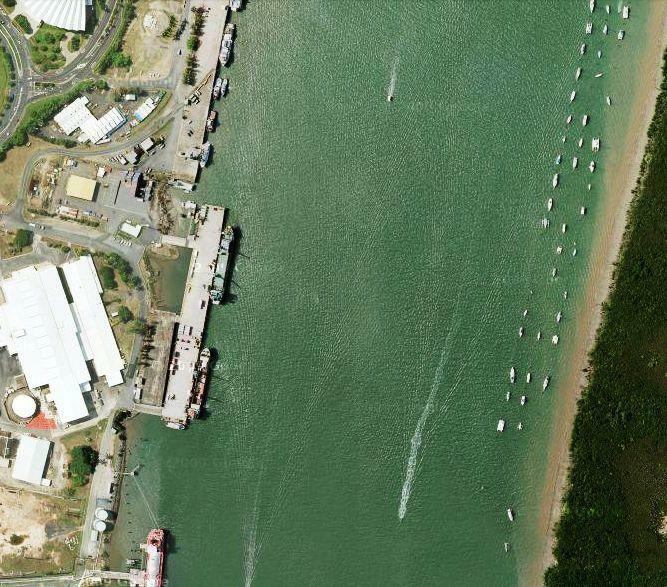 Our action will be to swim out in front of arriving US warships – to make them stop and wait while Queensland water Police clear us out of the way. With three swimmers, all of whom will non-cooperate (and two of whom will be fit), it ought take Police an hour or more to do that job. For that hour, the US Navy ship will be vulnerable. Under tow in a foreign civilian port. A big and important warship – like the USS Blue Ridge – might be kept vulnerable for several hours. If we can achieve these modest goals the US Navy will stop coming to Cairns.